The new state-of-the-art library building is constructed on a campus listed as a historic property by the State and National Registers of Historic Places. The new library replaces the existing building with a larger, modern facility that supports the educational needs of the students and satisfies the curriculum requirements of the instructors. The new 14,000+sf building is sited on the edge of Banyan Courtyard and consists of a main library space for reading/study/bookstacks, an archive area, librarian’s office and circulation desk. Adjacent to the main library will be a teacher workroom, student conference room, and staff restrooms, serving both the Library as well as the general school population. At the south is the media component, providing space for multi-media production, media control signal processing, resource centers and a technician’s office. 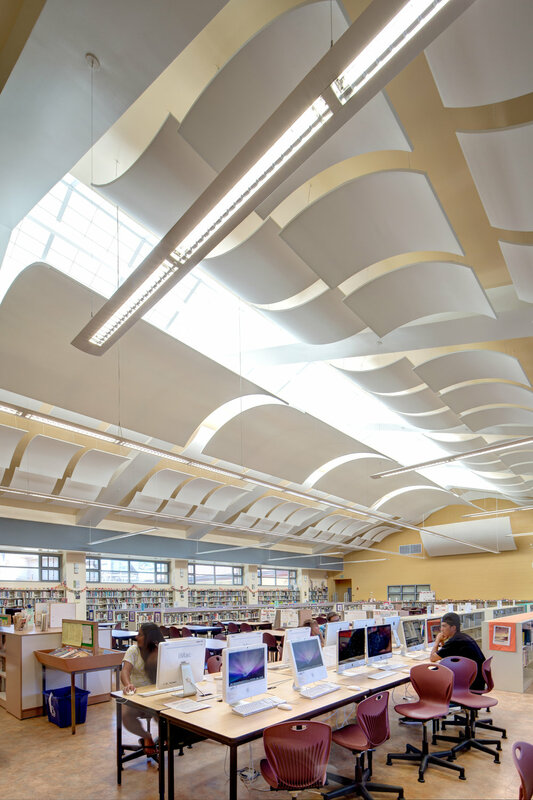 The media center provides media related curriculum for the students and is intended to be the model media/visual arts facility for State of Hawaii, Department of Education. The new building incorporates sustainable design features. The building was designed to best conform to Hawaii High Performance School Guidelines and Leadership In Energy & Environmental Design (LEED), LEED for Schools Guidelines. This is the first project for the State of Hawaii Department of Education that has achieved LEED for Schools “Gold”.